SEAT's Arona is a small SUV with an important role to play in the Spanish maker's model line-up. Sophisticated underpinnings make possible a more spacious cabin and a more engaging driving experience than most rivals can offer and across the range, this car has a sense of style that its fashionable clientele should like. 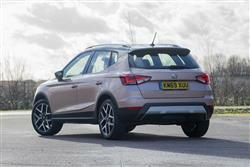 Here, we test the volume 1.0-litre TSI petrol version. As you would expect, the Arona is based on the Barcelona brand's Ibiza supermini, which means that it also shares that car's sophisticated MQB A0 platform - making it the first 'B'-segment Volkswagen Group SUV to get it. That's important because it leaves the Arona lighter than many of its rivals, so potentially more efficient. If this chassis can also play its part in delivering the kind of engaging handling that's endeared the larger Ateca to so many buyers, then this car really will be well set. We'll see. For now, we'll merely tell you that in the arguably more important areas that potential buyers in this segment tend to prioritise - practicality, media connectivity and scope for personalisation - the Arona makes a strong case for itself on paper, especially in this 1.0 TSI guise. But what will the reality of buying and owning one be like? That's what we're here to find out. With its only slightly larger Ateca SUV, SEAT has already shown it can produce a compact Crossover with class-leading standards of ride and handling and if you come to this car in search of a slightly smaller Crossover of that kind, you'll find that the Arona continues that strong showing. If you happen to be familiar with rivals in the small SUV segment, you may well notice that the steering here is more direct, the corner turn-in's more precise and that body roll is rather better controlled. 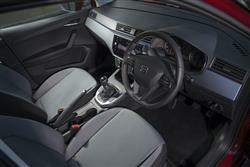 Credit for much of this can be given to the stiff, sophisticated MQB A0 platform this model shares with the fifth generation Ibiza supermini it's based upon. That's not to say that it feels in any way really sporty: no car in this segment is. 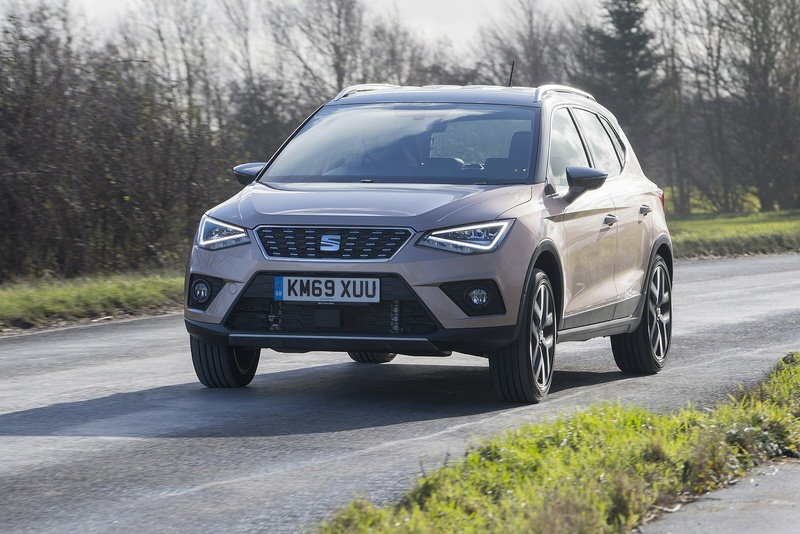 SEAT's preference has been to set the Arona up for the low speed, traffic-jinking needs of the urban jungle and sure enough, it feels right at home in that environment, with its great all-round sight lines and tight turning circle. 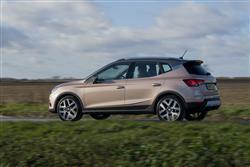 As for engines, well most will choose the likeable 1.0 TSI turbo petrol variant we tried. As usual, two variants of it are available, most folk likely to stick with the 95PS version which, if you're quick through slick ratios of the 5-speed gearbox, makes 62mph from rest in 11.2s on the way to 107mph. The alternative option is the 115PS unit we tested, which improves those figures to 9.8s and 113mph, gives you a 6-speed manual gearbox and comes with the option of 7-speed DSG auto transmission. The Arona, says SEAT, 'transcends age barriers'. Not sure about that. The truth is that it's very obviously targeted at the younger folk driving sales in this segment, though there's also enough boxy practicality here to interest more adventurous small families too. These people will see at a glance that the Arona is a more versatile proposition than the Ibiza supermini it's based upon, 79mm longer and 99mm taller than that car. From the side, what would otherwise be a square rather unremarkable profile is enlivened by these two almost arbitrary upper coachwork slashes just below the glass line. And plenty of crossover trinketry - most obviously the contrast-coloured roof. 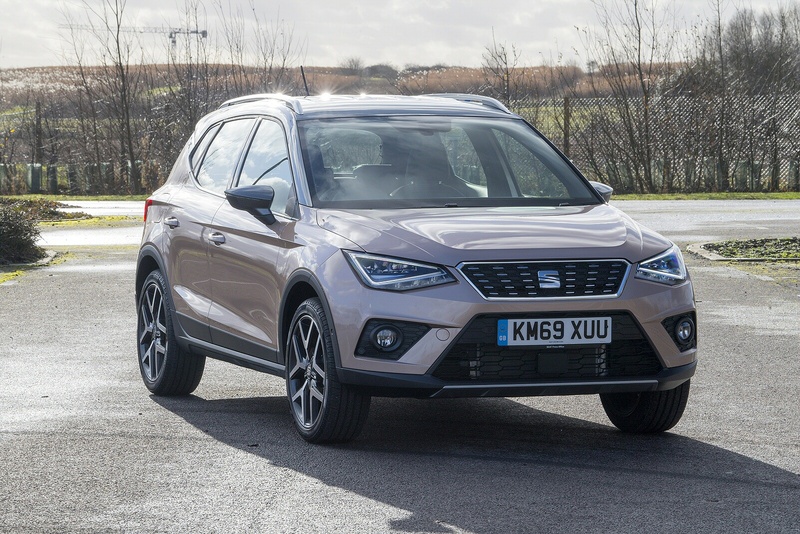 While other makers in this sector have merely dabbled with this concept, SEAT has whole-heatedly embraced it, standardising this feature for those that want it and offering customers orange, black or grey colour options. And inside? 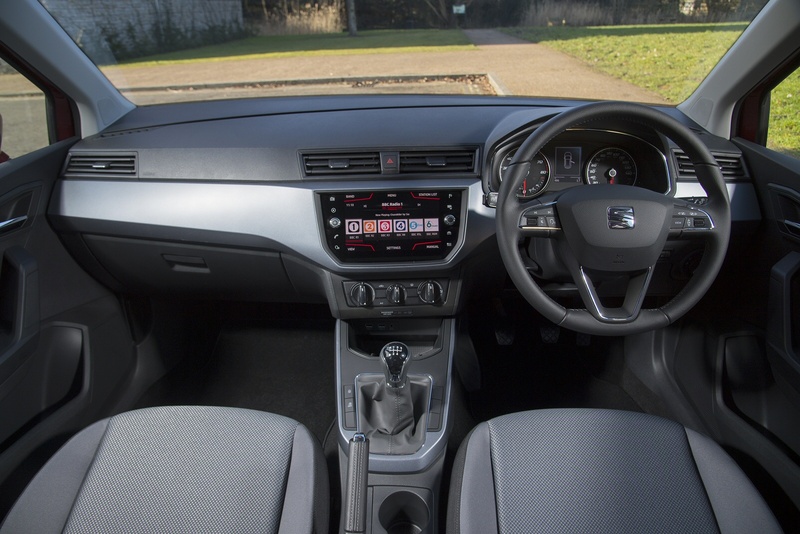 Well if you like the funky attitude of the exterior, you might be a little disappointed to find that little of it has been carried over to the cabin, which is virtually identical to the rather conservative interior you get in an Ibiza - though you do sit a little higher. What's not up for debate is the quality of what's provided here, something nicely complemented by the classy glass-fronted 8-inch infotainment screen that most models get. As well as the usual Bluetooth and DAB tuner, this incorporates 3D navigation, voice recognition and SEAT's 'Full Link' smartphone-mirroring system. There's also a decently-sized 400-litre boot. Arona pricing starts from around £16,000 and runs to just under £25,000 and there are three core trim levels - 'SE', 'FR' and 'XCELLENCE', with variants in each case. We'll get into detail on that in a minute. 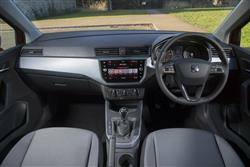 The engine choice on offer is pretty much the same as you get in an Ibiza and as usual in this segment, is primarily geared towards petrol power. The green pump-fuelled options are mainly 1.0-litre three cylinder units and most buyers will want the 1.0-litre turbo TSI powerplant we tried, offered with either 95 or 115PS, with the faster version gaining a 6-speed manual gearbox. That perkier 1.0-litre TSI derivative is the only variant in the range that can be ordered with an automatic gearbox, a 7-speed DSG transmission that costs an extra £1,300. 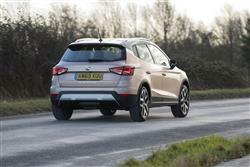 The other Arona engines on offer will be rarely seen, but both have plenty to be said for them. For petrol people, there's a 1.5-litre TSI EVO unit that has plenty of power - 150PS - and impressive frugality too, thanks to clever cylinder deactivation technology. If efficiency really is a priority though, you'll want the 1.6-litre TDI diesel, offered with either 95 or 115PS. You've really got to be covering a much higher annual mileage than is typical for cars of this kind though, if you're to justify the TDI powerplant's price premium of more than £2,000 over the equivalent 1.0-litre TSI petrol variant. Of course, like all Crossover SUVs, the Arona is heavier than the conventional hatch it's based upon: in the case of the base 1.0-litre TSI variant, the weight gain over a directly comparable version of the Ibiza supermini is 43kgs. You'd think this wouldn't be enough to drain that frugal little car's fuel and CO2 showing too much and, sure enough, the impact is fairly minimal, the downside over an Ibiza being about 2mpg and 5g/km of CO2. You could cope with that couldn't you? To be specific, both 1.0 TSI Arona models can return up to 57.6mpg on the combined cycle. As for emissions, well the 95PS version delivers 111g/km of CO2 and you'll do no worse than 114g/km in the pokier 115PS variant. Opting for the 1.0 TSI 115PS model with DSG auto transmission has virtually no impact on these figures. Overall, it's difficult to do much better than that in this class. As for the reasons behind this showing, well they're not solely down to questions of weight. There's a lot of very clever engineering on offer here. Take the 1.0-litre TSI engine's particularly efficient variable camshaft adjustment and its optimised thermal management, which significantly reduces emissions in the warm-up phase. If you�re looking for a new SEAT Arona 1.0 TSI 115 SE Technology [EZ] 5dr DSG Petrol Hatchback for sale, you�ve come to the right place. At Bristol Street Motors we don�t just have the best SEAT Arona 1.0 TSI 115 SE Technology [EZ] 5dr DSG Petrol Hatchback deals, we also offer friendly advice and help with all your enquiries to ensure your buying experience is a happy experience.